Please note : Most of the NCEP real-time model web pages listed below are generated on the NCEP development computer, and therefore will not be updated when this computer is down. The web graphics for the NAM 12-km parent, GFS, GEFS, NAM Alaska/CONUS/Fire Weather nests, SREF, HiResW runs, RTMA/URMA, RAP, and HRRR on the NCEP Model Analysis and Guidance (MAG) site are operational, created in near real-time, and subject to 24/7 monitoring by NCEP Central Operations. If you have any questions please email Eric Rogers at eric.rogers@noaa.gov. Monthly (diurnal) composite of 00-hr to 84-hr forecast from the NAM and GFS models verified against observations averaged by region and composited on a monthly basis for 00z and 12z cycles. The CMAQ Kalman Filter Analog (KFAN) bias correction system for fine Particulate Matter (PM2.5) will be improved to use a consistent training data set, additional monitor sites and a unified KFAN bias correction system. For the first time, the unified KFAN bias correction system will also be employed on CMAQ ozone predictions. 4x/day cycling runs of CMAQ V5.0.2 with updated oil and gas sector emissions for year 2017 (implemented May 1, 2018). Updated Environmental Protection Agency (EPA) National Emissions Inventory base emissions to NEI2014V2. Turn off fire smoke emissions from November through April. For Alaska and Hawaii (O-CONUS): Update the chemical transport model to unified CMAQ V5.0.2 used for all domains. All AQM ozone and PM2.5 AWIPS grid files (CONUS 227, Alaska 198 and Hawaii 196) will no longer output associated bitmap information to reduce file size. In addition, nearest neighbor option will be used to interpolate from the native CMAQ grid to the AWIPS output grids to reduce unrealistic gradients when using the bicubic interpolation approach. The RTMA-RU system latency is improved such that product delivery occurs within 15 minutes of the cycle time. Guam RTMA will change from a three-hourly analysis system to an hourly analysis system. Guam RTMA will change to use a background field from the 3-km Guam High-Res Window forecast, rather than a 13-km GFS forecast. The new high spatial resolution background is generally of a longer forecast length, since the High-Res Window model only makes forecasts for cycles 00Z and 12Z, while the GFS makes forecasts for cycles 00Z, 06Z, 12Z and 18Z. In addition, the first five hours of each High-Res Window forecast are discarded to avoid noise in the RTMA background. The ceiling/sky cover analysis is expanded to all OCONUS domains in support of the National Blend of Models (NBM). The significant wave height analysis is expanded to the OCONUS URMA domains. The ceiling and visibility analysis is improved for all domains through the use of a general nonlinear transformation of variables in the data assimilation algorithm. CONUS RTMA/URMA/RTMA-RU will begin assimilating new visibility observations from Mesonets via a use-list provided by NOAA Earth System Research Laboratory (ESRL). The coastal gaps in the CONUS URMA precipitation analysis are filled via the incorporation of available Multi-Radar Multi- Sensor (MRMS) and the Climate Prediction Center MORPHing Technique (CMORPH) precipitation analysis data. For CONUS domains of RTMA, URMA, and RTMA-RU, update the analysis observation selection algorithm to only use the observation closest to analysis time instead of fitting among the full window of reports from a single station. Updated wind Quality Control (QC) lists for Mesonets. Updated version of the Gridpoint Statistical Interpolation (GSI) analysis code. Weighting of the ensemble in hybrid GSI will increase from 0.75 to 0.85. The RAP and HRRR will both begin using WRF version 3.8.1; both will continue to use the ARW core. Adds a second Weather Research and Forecasting (WRF) Advanced Research WRF run (ARW2) member (current cycle run plus the 12 h old run). Reduces the number of North American Mesoscale (NAM) 3 km CONUS nest members in HREF from five to two (previously included the current cycle plus 6, 12, 18, and 24 hour old runs; now uses just the current cycle plus the six hour old run). Reduces the number of Nonhydrostatic Multiscale Model on B-grid (NMMB) members from HIRESW from three to two (previously included the current cycle plus the 12 and 24 hour old runs; now uses just the current cycle plus the 12 h old run). Reduces the number of HIRESW WRF-ARW members from three to two (previously included the current cycle plus the 12 and 24 hour old runs; now uses just the current cycle plus the 12 h old run). Unifies the horizontal grid spacing at 3 km for both the ARW and NMMB models (3.2 km for both over CONUS). Add a second ARW (ARW2) member for all domains, except for Guam, that is initialized from the NAM. This second member also uses the Mellor Yamada Janjic (MYJ) planetary boundary layer (PBL) and MYJ surface layer physics, so differs from primary HIRESW ARW member in terms of the physics used in addition to having a different source of initial and lateral boundary conditions. It also has just 40 vertical levels, while the primary ARW1 member has 50 vertical levels. The NMMB run increases the call frequency for PBL/surface physics and microphysics from every fourth model time-step to every other time-step. Changes the vertical level structure within the primary 50 level ARW1 runs for all domains except Alaska. Counting from the surface upward, layers 7-18 (roughly 970 to 760 hPa for a surface pressure of 1010 hPa) are made somewhat thicker, and layers 19-30 (roughly 690 to 330 hPa for a surface pressure of 1010 hPa) are made somewhat thinner. This change was made for Alaska only in a previous fix to improve numerical stability, and is extended to all domains with this upgrade. Runs considerably earlier within production suite by using 6 hr old GFS (or NAM for the ARW2 member) files to generate lateral boundary conditions. Runs that use the GFS for initial conditions now utilize a 6 hr forecast from the 6 hr old GFS for initialization. Changes from 0.5 degree to 0.25 degree GFS data for use in producing initial and lateral boundary conditions. Initializes the Puerto Rico domain runs from the RAP (previously initialized from the GFS); the new ARW2 member for Puerto Rico is NAM initialized. Replace 12-h NAM Data Assimilation System (NDAS, 3-h analysis updates for the 12 km parent domain) with a 6-h data assimilation cycle with hourly analysis updates for the 12 km parent and the 3 km CONUS/Alaska nests. The Hawaii/Puerto Rico/Fire weather nests will be initialized from the 12-km first guess at the end of 6-h assimilation cycle. Use of lightning data (from NLDN and ENL networks) and radar reflectivity-derived temperature tendencies in the diabatic digital filter initialization. Add execution of the diabatic digital filter initialization prior to the NAM free forecast (was only run during NDAS in previous ops NAM version 3). Perform tropical cyclone relocation for the 12 km parent domain at the start of the 6-h DA cycle and for the NAM forecast first guess. All NAM nests grids will be output hourly from 0-60 hours; in the previous ops NAMv3 they were output hourly from 0-36 hours and 3-h from 39-60 hours. Replace the current terrain and land/sea mask used in the system with the new EMC/GFE consensus terrain and land/sea mask in the 2.5km CONUS domain. The use of the common terrain and land/sea mask will eliminate the need for NWS forecasters to reduce the RTMA and URMA analyses to their local GFE terrain. Improve the CONUS and Alaska grids of wind speed by analyzing wind speed directly as a scalar, as opposed to deriving it from the control variables of stream function and velocity potential. Produce new URMA output for Hawaii and Puerto Rico on 2.5km grids. These new URMA systems will provide "truth analyses" for the National Blend of Models Project. The output will contain analysis and analysis uncertainty for the following parameters: Surface pressure, 2m-temperature, 2m-dewpoint, 2m-specific Humidity, 10-m u-wind component, 10m-v wind component, 10-m wind speed, 10-m wind direction, 10-m gust, and surface visibility. Replace the current terrain and land/sea mask used in the system with the new EMC/GFE consensus terrain and land/sea mask for the 2.5km CONUS domain. Modify the wind gust calculation at intermediate hours (1,2,4,5, etc) to use the maximum of the NAM nest wind gust and downscaled wind speed. This calculation is already done at the 0,3,6, etc forecast hours and this change will make it consistent across all forecast hours. Add new variables: Cloud Ceiling height [gpm], and Mean Sea Level Pressure (Eta model reduction) [Pa] to the 2.5km CONUS, 3km Alaska, Puerto Rico and Hawaii NAM DNG files on the NCEP ftp server. Add hourly output of Total Cloud Cover field for all NAM DNG domains. It was previously available only every 3 hours. Remove the 5km CONUS and 6km AK NAM DNG GRIB files from the NCEP servers. These products have been replaced by the 2.5km CONUS and 3km Alaska products. Modify the GRIB encoding for the Haines Index fields will be modified to use the value 9.9 x 10^10 for the missing value. Update the SREF ensemble mean, probability and spread products on NOAAPORT to add the 0-3h accumulated precipitation parameter, which is erroneously being skipped. Add the following fields to all of the SREF output grids (grids 132, 212, 216, 221 and 243) on the NCEP ftp server: Water Equivalent of Snow Depth (both instantaneous and 3-hourly Snow Depth. Refinements are made to the GSI to improve the assimilation of surface observations, soil moisture adjustment, and three- dimensional cloud and precipitation hydrometeors. Weighting of the ensemble in hybrid GSI will increase from 0.50 to 0.75. Introducing direct use of 2-meter temperature and dew point model diagnostics in the GSI. Specific to the HRRR, the application of radar reflectivity data in the GSI to direct specification of 3-dimensional hydrometeors is increased to apply to a broader range of weather conditions, including warm-season events with reflectivity up to 28 dBZ. The RAP and HRRR will both begin using WRF version 3.6.1; both will continue to use the ARW core. The MYNN planetary boundary layer scheme is being updated to include the effects of subgrid-scale clouds. The mixing length formulation in the boundary layer scheme and thermal roughness in the surface layer are being changed. The 9-level RUC land-surface model is being updated to add a mosaic approach for fractional snow cover, improve the fluxes from snow cover, and modify the wilting point for cropland use. Major updates are being made to the Thompson microphysics scheme, including making it aerosol-aware with use of an ice- friendly and water-friendly aerosol field. Shortwave and longwave radiation have been changed to use the RRTMG (RRTM global) scheme that includes the effects of aerosols and boundary layer subgrid-scale clouds. The WRF-ARW diagnostics for 2-meter temperature and dew point are being improved. The convective scheme in the RAP is changed from the Grell 3-D scheme to the scale-aware Grell-Freitas scheme. For hourly precipitation RTMA: use Stage IV hourly as primary source of precipitation RTMA, supplemented by Stage II hourly when Stage IV is not available at the time precipitation RTMA is made. For 6-hourly precipitation URMA: coverage inside of an RFC's domain proper will only come from that RFC (previously, if an RFC's input is late or missing, coverage from neighboring RFCs is used). The WGRFC domain will be expanded to cover its area of responsibility in Mexico. Areas outside of the RFC domains (except for Gulf of Mexico and the Atlantic) will be set to no data/missing. Coverage for the Great Lakes will come from specific RFCs assigned to each Lake (previously, the average of all available coverage from nearby RFCs is used for the Great Lakes). Daytime maximum temperature (TMAX) analysis, and overnight minimum temperature (TMIN) analysis along with the corresponding fields of the analysis uncertainty are added to the URMA-CONUS GRIB2. The new fields have a nominal spatial resolution of 2.5 km and are produced once a day. Additional airport temperature data : RTMA temperature data will be interpolated at an additional 141 airports (all in Alaska) to serve as a real-time observation where an observation is unavailable. The background changed from downscaled 13 km RAP analysis to a blend of the 3 km HRRR and 4 km NAM CONUS nest. The RAP analysis is still used in RTMA/URMA regions outside the HRRR domain. Windblown dust emissions are included using threshold friction velocity and soil wetness fraction with climatological source composition and locations. Use the model lowest-level values for the 2m T, Td q, RH and 10m u and v fields for the 7 NMMB members at initial time f00; these fields do not have correct values in the current operational SREF. Switch the hypsometric option in the ARW model back to the version in the original wrf3.3 version from option 2 (height is derived from log pressure) to option 1 (derived from pressure); this will make the model more reliable. Water equivalent of accumulated snow for all 7 ARW members. Begin disseminating 2m temperature and 3-hourly accumulated precipitation for all 21 SREF members on the 32km North American domain (grid 221) via NOAAPORT. More details about these products, including WMO headers, can be found in NWS TIN 13-44. Modify the clustering algorithm to preserve time-continuity within a cluster over each of the three pre-selected forecast periods (00-39hr, 42-63hr, 66-87hr). This change will make available a larger number of cluster files. Also, some of the spacing in the sref_cluster_info text file will change. Modify the list of stations for which SREF BUFR output is generated. The details of the additions, replacements and eliminations of stations are listed below. There were 68 sites added. Diversity in land surface initial states (NDAS, GFS, and RAP). Addition of hourly ensemble product output from 1-39 hr. Increase in domain coverage compared to the RUC, including Alaska and the Caribbean basin and almost all of North America. Use of the WRF modeling framework, with the Advanced Research WRF (ARW) forecast model with RUC physics. Match most existing RUC products and add new ones to cover the expanded domain. Introducing the experimental North American Rapid Refresh Ensemble using Time Lagged (NARRE-TL) forecast. Modifying some product output and changing the names of all directories and output filenames from *ruc* or *ruc2a* to *rap*. Use expanded rain look up tables, increasing the maximum size of raindrops from 0.45 to 1.0 mm. Parameterizes sedimentation of 50-micron ice crystals. New cloud water to rain autoconversion (PRAUT) scheme following work of Liu & Daum et al. This new scheme no longer requires an autoconversion threshold, and the functional dependence of cloud water mixing ratio is quite different from the original Kessler-based formulation. NCW increased from 100 to 200 cm^-3. T_ice_init=0 results in faster initiation of ice. In 1D column runs it produced higher maximum surface rainfall rates. FLARGE2=0.07 based on tests by JMA visiting scientist Nakagawa in his global runs. The parameter determines the number fraction of large precipitation ice particles. VEL_INC~VRIMEF**2 â€“ even faster rimed ice fall speeds than in the HAIL microphysics. The HIRESW model will be updated from Weather Research and Forecasting (WRF) version 2.2 code to WRF version 3.2 code for both the Advanced Research WRF (ARW) and the Nonhydrostatic Mesoscale Model (NMM) members of the system. Both the ARW and NMM models will use better conserving moisture advection..
New high-resolution, hybrid ensemble output will be created that combines uncertainty information from the Short Range Ensemble Forecast (SREF) with deterministic forecasts from the HIRES. Output products from this HIRES ensemble will include mean, spread, and probabilistic guidance. The removal of snow at grid points where the NESDIS snow analysis does not support its presence is changed from once pre day at 19Z to twice per day at 17Z and 23Z. A land-sea mask will also be incorporated into this algorthim due to the difference in resolution between the NESDIS analysis and the RUC. Fixed a bug in the horizontal advection of W and height in the non-hydrostatic module; missing factor of 2 added. Removed the addition of rain water mixing ratio to the input cloud water mixing ratio array used by the GFDL radiation code. This change should make the clouds less opaque to SW and LW radiation at grid points where rain is falling in the column. Bug fix in turbulence routine to declare and define CAPA (R/Cp). The assumed fraction of large, precipitating ice particles to the total number concentration of ice particles is reduced from 0.2 to 0.03, which acts to increase the number of small, nonprecipitating ice particles. This change improves NAM simulated GOES brightness temperatures. Enforce a minimum number concentration for large ice particles (1 per liter) at all temperatures, rather than not enforcing it at >0C in the operational code where a fixed mean diameter is assumed. When initiating ice in water saturated conditions, growth rates are calculated by combining the number concentrations of ice initiation from eq. (2.4) of Meyers et al. (JAM, 1992) with estimated mass growth rates of ice crystals using the calculations of Miller and Young (JAS, 1979). The Miller-Young calculations were in cgs units (g per unit time), so the values in the model need to be multiplied by 1e.-3 to convert to mks units (kg per unit time) in subroutine MY_GROWTH_RATES. Fixed a bug in the computation of dew point temperature in the post-processing routine that determines categorical precipitation type. Three of the four models used in the SREF (NMM, ARW, and RSM) are upgraded; NMM and ARW from WRF V2.0 to WRF V2.2, RSM from v2003 to v2008. The number of WRF-NMM and WRF-ARW members are increased from 3 to 5; the number of Eta members is reduced from 10 to 6, and members n3, n4, and p3 and p4 removed. Introduce more physics diversity by switching from Zhao cloud scheme to Ferrier cloud scheme in three out of five RSM members. GRIB forecast output frequency will increase from 3-hourly to hourly for the first 39 hours (CONUS grid only). BUFR sounding output from each SREF member will be broken out into individual station time series. Introducing the NESDIS snow analysis to eliminate snow cover at model points where the analysis indicates no snow is present. The new code will introduce the NESDIS analysis once per day at 1900 UTC and will eliminate snow cover at any point where 1) the analysis shows no snow, 2) the model surface temperature is above 274 K, and 3) no precipitation has fallen during the previous one hour forecast. Changing the call to the analysis of cloud data so it occurs near the end of the analysis process. This will prevent non- cloud observations from causing subsaturation at grid points where clouds exists. A final check is made to make certain that any grid point with analyzed cloud is saturated. Modifications to the code to allow GOES satellite cloud data to supercede any METAR report of clear skies. 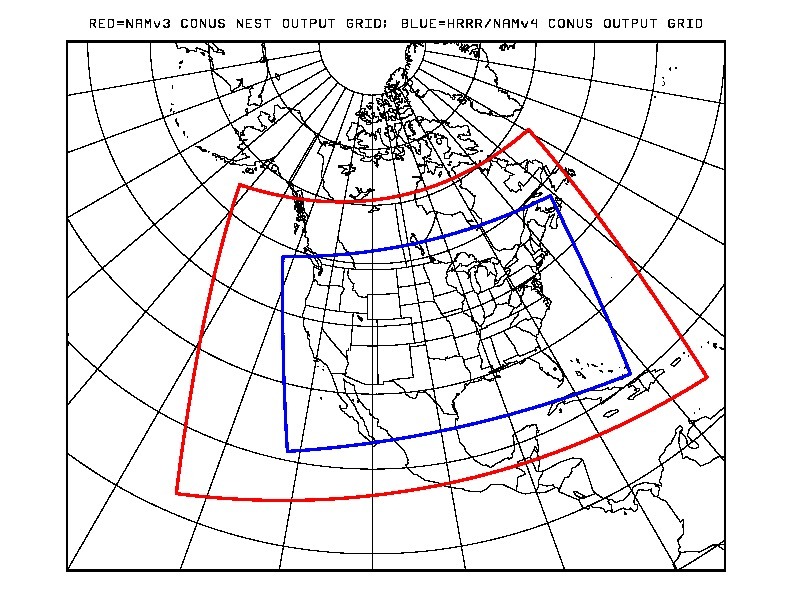 The NCEP operational Nested Grid Model (NGM) was turned off as of this cycle. At the start of the first (tm12) forecast of each NDAS run, the WRF-NMM forecast model, instead of cycling the frozen soil moisture from the previous NDAS run, was recomputing it using the explicit Flechinger equation. This led to inconsistencies between the frozen soil moisture and both the total (liquid+frozen) soil moisture and the soil temperatures, leading to warm 2-m temperature biases in cold regions. As of this date the error has been fixed. Note : This code error, in the forecast code since the unified Noah land-surface physics was implemented on 31 March 2008, was never invoked in the operational NDAS until it began to be initialized from the GDAS first guess on 16 December 2008. The background for the first (tm12) analysis in each NDAS run is now from the GDAS instead of the previous NDAS run (so-called "partial cycling"). Land states are still fully cycled from the previous NDAS cycle. The PBL/turbulance schemes were modified to mix each hydrometeor species in the vertical. To apply vertical diffusion for separate water species, the model was changed so that (a) it can apply vertical diffusion to an arbitrary number of species, (b) the counter gradient option can be applied to some or all of the species if desired, and (c) option to set to zero some or all of the surface fluxes is also made available. Let the potential evaporation decrease linearly with Bulk Richardson number under stable condition, and weighted by snow coverage. Let the slope of saturated humidity function wrt temperature decrease linearly with snow coverage. Modify the convective scheme to reduce the excessive generation of light precipitation areas. Specify three-dimensional latent heating in the diabtic digital filter initialization. Add four new land-surface fields (soil type, vegetation type, land/water mask, and ice cover) to the native level output files. Modify post-processing code to correct the GRIB PDS (product description section) time descriptors for very short-range precipitation forecasts. Operational implementation of the Real-time Mesoscale Analysis (RTMA) over Hawaii and Puerto Rico. Point, area and mobile emissions will be upgraded based upon recent EPA National Emissions Inventory (NEI, 2005) and then projected for the current year. EGU sources will use 2006 CEM data projected for 2008. Use of OTAQ on-road emission estimates is a departure from the temperature dependent regression approach used in previous years. Begin assimilation of AIRS radiance data in NDAS/NAM GSI analysis. This was not implemented on 31 March 2008 as intended due to a script error. Operational implementation of the Real-time Mesoscale Analysis (RTMA) over Alaska. The computational domain of the NAM was increased by ~18%, click here to see a comparison with the old NAM computational domain. Use gravity wave drag/mountain blocking. Run with SIGFAC=0: gravity wave drag responds only to ELEVMAX, the maximum elevation within the grid box only. No further inflation is done based on the standard deviation of the 30" heights in the grid box. Use new Unified (with NCAR) Land-Surface Physics module. This module now uses total soil moisture rather than liquid soil moisture (as in the previous NCEP/noahlsm) to determine bare-soil evaporation, which results in greater moisture fluxes (and thus higher near-surface dew point temperatures) over regions of frozen, bare soil with patchy or no snow cover. Use of new passive advection with the requirement for exact conservation of specific humidity, TKE, and cloud water relaxed in the advection step. The exact conservation is still required in the antifiltering step following the advection step. Stratospheric ozone fix in the computation of latitude: the error led to using climatological ozone values valid at the equator at all latitudes. Compute the upward LW at the surface was based on the ground (skin) temperature instead of the average of the skin and lowest model layer temperatures. Use new terrain with "3x3" (smoothed-desmoothed) smoothing, a smaller (more realistic) Great Salt Lake, better depiction of the Channel Islands off the California coast, and spurious waterfalls removed; use climatological water temperatures for Lake Champlain. Expanded domain (5X) to cover Continental U.S.
Due to computing resource constraints EMC will no longer run the cancelled HIRESW WRF-NMM forecast on the development computer at this time. Elevation gradient near coastlines made artifically large to onbain sharper background error covriances, which reduced influence of coastal land stations on the analysis of temperatures over water. Under stable conditions, modify roughness length for heat so that it is only a function of surface-layer bulk Richardson number, removing the dependence on surface elevation. The minimum canopy resistance was increased for evergreen needleleaf forest (doubled from 125.0 to 250.0, units of s/m) and for mixed forest (from 125.0 to 150.0). The divergence damping routine, which damps all gravity-inertia and external modes, is changed to increase damping of the external mode. During the NDAS, divergence damping is increased to 5x that used during the 84 hr NAM free forecast. The search for the most unstable parcel is extended from the lowest twenty percent of the atmosphere to the lowest 40 percent of the atmosphere. Water loading effects are now included in assessing the buoyant instability of parcels from which a revised (lower) cloud top is determined to be at the highest level of positive buoyancy. The latent heat of vaporization used to calculate equivalent potential temperatures during model integration is made to be consistent with the value used in generating the initial lookup tables. When a grid point fails the entropy check for deep convection but still has positive CAPE, changes in temperature and moisture by shallow convection are then considered at these so-called "swap" points. The first-guess estimate for the top of shallow convection is based on the highest level where the parcel remains positively buoyant (this is more restrictive than positive CAPE), and the vertical extent of shallow convection is not to exceed 0.2 times the atmospheric pressure depth (e.g., 200 hPa for a surface pressure of 1000 hPa). A final adjustment is made to the top of shallow convection in which it can extend to higher altitudes if the mean ambient relative humidity (RH) in the cloud layer exceeds a threshold RH while remaining positively buoyant (i.e. CAPE greater than 0). The threshold RH is based on the RH at cloud base that is consistent with a deficit saturation pressure of 25 mb (usually near 90%). The maximum cloud top height for shallow convection is still limited to 450 hPa. The first-guess reference temperatures in the upper-half of shallow convective clouds are limited to be no more than 1 deg C colder than the ambient temperature. During melting precipitation ice particles are assumed to have the same mean diameter (1 mm) as at the freezing level. The temperature at which small amounts of supercooled liquid water, if present, are assumed to be glaciated to ice was lowered from -30C to -40C. Allow horizontal diffusion between neighboring grid points with a slope of less than or equal to 54 m / 12 km (9x that in previous operational NAM). Revert back to using the 1/2 degree RTG_SST analysis used in the NAM-Eta due to problems with a persistent cold bias in the hi-res (1/12th degree) RTG_SST analysis in and north of the Bering Strait and in Hudson's Bay. Modified the SST preprocessing job to use new climatological values for Great Salt Lake water temperatures from the University of Utah; a cosine fit to the bimonthly observational data from Saltair Boat harbor (from 1972-1989). From Steenburgh et al., 2000: Climatology of Lake-Effect Snowstorms of the Great Salt Lake. Monthly Weather Review, 128, 709-727. Operational implementation of the Real-time Mesoscale Analysis (RTMA) over the CONUS. Begin use of new observation types: WSR-88D Level II radial wind data, GPS-Integrated Precipitable Water (IPW) data, and NOAA-18 radiances. Northeast US operational forecasts replaced with Eastern U.S. (3X) runs. Operational Eta forecast system officially renamed North American Mesoscale (NAM) forecast system; Eta Data Assimilation System (EDAS) renamed NAM Data Assimilation System (NDAS). The "masked" horizontal interpolation of SST data was generating spurious 290K temperatures over parts of the Arctic Ocean, leading to unrealistically warm near-surface temperatures. Native-grid GRIB output from the HI and PR WRF-ARW runs were being labeled as Lambert Conformal, when the integration domain is actually Mercator. Improper hardwiring of the map type to a Lambert Conformal projection was removed from, and the problem that necessitated the hardwiring was eliminated. Made modifications so an initial snowcover would be properly defined within the WRF-ARW. The reduced sea-level pressure in the WRF-ARW was in poor agreement with the initializing Eta model data at the initial time (up to 5 hPa too low relative to the Eta), and would continue to have a low bias through the forecast period. A moisture component of pressure that is subtracted out during initialization of the WRF-ARW was added back in the post. Fixes which ensure that output from both WRF cores will produce bit-identical answers regardless of the number of processors applied to the task. Modified two routines to process properly the snow and snowcover fields now coming out of the WRF-ARW. The effect of horizontal shear of vertical velocity has been added to the lateral diffusion scheme. The fundamental time step has been reduced by 10%. The effect of entrainment has been incorporated into the procedure for finding convective cloud top pressure. To improve the quality of the Eta initial conditions: 1) surface temperatures over land are not used in the Eta 3DVAR analysis, and 2) all surface data that is not within 6 minutes of the analysis time is excluded. Assimilation of GOES cloud top pressure, Stage IV precipitation data, and super-observations of NEXRAD radial wind data. The 03Z run of the Eta-29 (Meso Eta) was replaced by an 03Z run of the Eta-32. This forecast will will be the same length as the Eta-29 (33-h). It will be initialized by a 3-h EDAS assimilaition starting at 0000 UTC using the Eta 3DVAR analysis and an EDAS first guess.